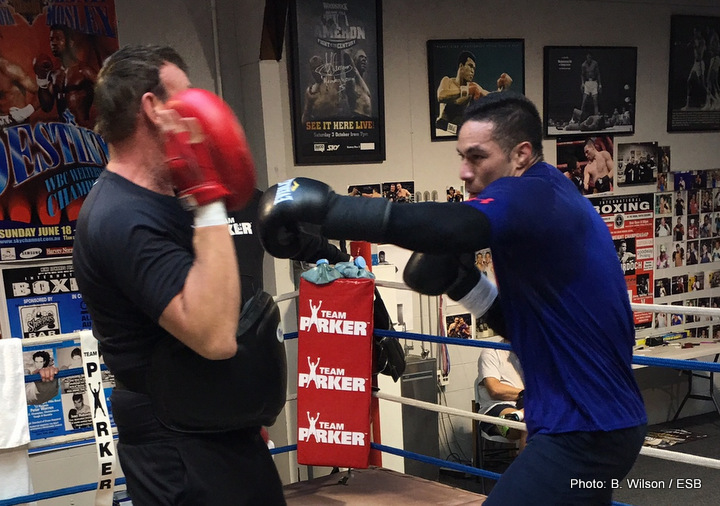 Joseph Parker’s promoter Deal Lonergan has revealed how he has been in talks with the UK’s Eddie Hearn about the idea of having Parker, the mandatory challenger for Anthony Joshua’s IBF belt, fighting on a Joshua under-card this November. The plan is to make Parker a big name in the UK, so as to make the upcoming Joshua-Parker fight that much bigger. Lonergan also spoke to The New Zealand Herald about his desire to match his unbeaten fighter with former champ David Haye. This fight, Lonergan says, would not be on any under-card, so big would it be in his opinion. Haye will, it seems, have to earn a shot at Joshua, as Lonergan suggests. Hearn recently said Haye is currently further away from a Joshua fight than he was before his second comeback fight – the farcical blow-out of Arnold Gjergjaj. Haye might have to get into mandatory position to get his shot. Parker – who will keep busy with a July fight against Solomon Haumono – would be a risky fight for Haye, but the winner would be in a great position. Let’s see if Haye – who, interestingly, has also been called out by new WBC cruiserweight champ Tony Bellew – will take this 50-50-looking fight. If not, Parker might appear on the card of Joshua’s planned November defence. Either way, it seems Parker will be fighting in the UK soon.